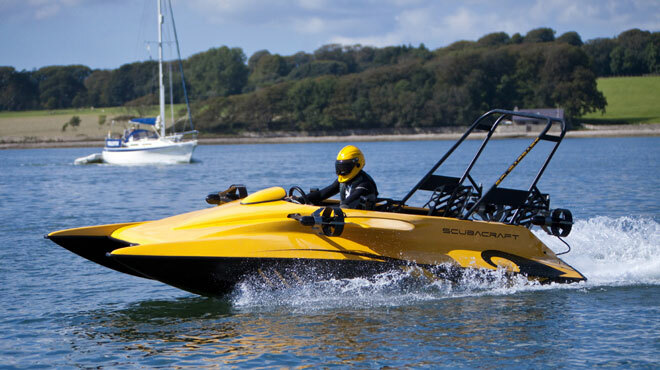 Creative Worldwide Ltd, based in Wales, have unveiled a remarkable watercraft which is a mix of speed boat and submersible. 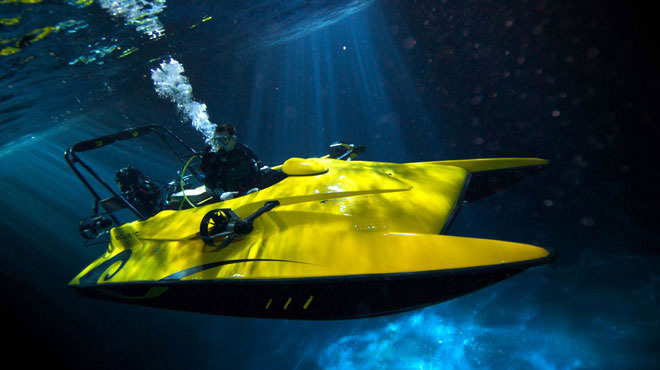 Called the Scubacraft SC3 this amazing vehicle can travel at up to 50 mph on the surface of the water, and then once at the dive location it can submerge itself and up to three occupants and take them down to a depth of 30 metres (100 feet). 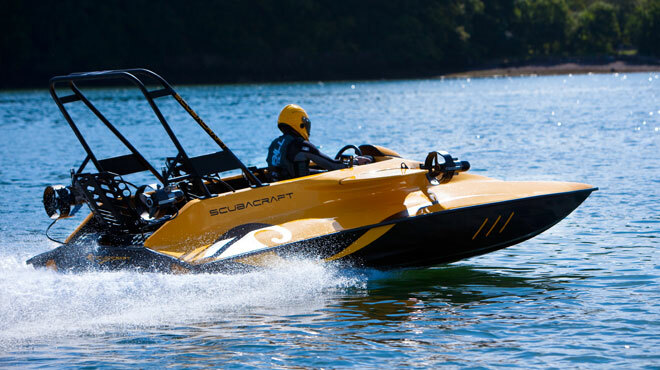 On the surface the Scubacraft SC3 is powered by a 160 horsepower, inline 4-cylinder, 4-stroke engine with waterjet drive. 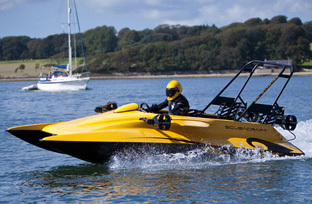 When combined with an incredibly light overall weight of less than 400 kgs (860 lbs) this allows for the 50 mph top speed. 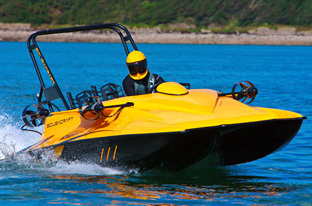 The advanced twin tunnel hull is another one of the reasons the SC3 can achieve these speeds. 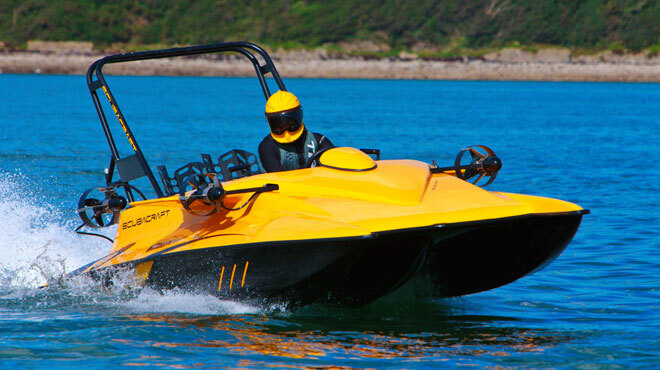 This cleverly designed monocoque unit traps a cushion of air underneath which helps lift the vehicle out of the water and reduces the drag from the water's surface. To submerge the SC3 the operator deflates two large inflatable tubes which are located within the hull. At the same time water is let in through the transom. 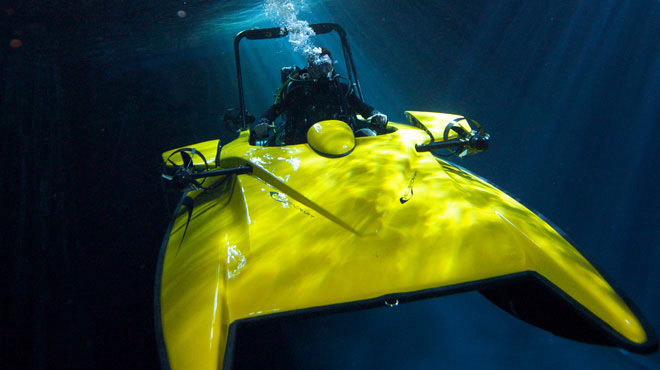 Once underwater the SC3 is powered by four electric thrusters - which are located at the front and rear, and lithium batteries. 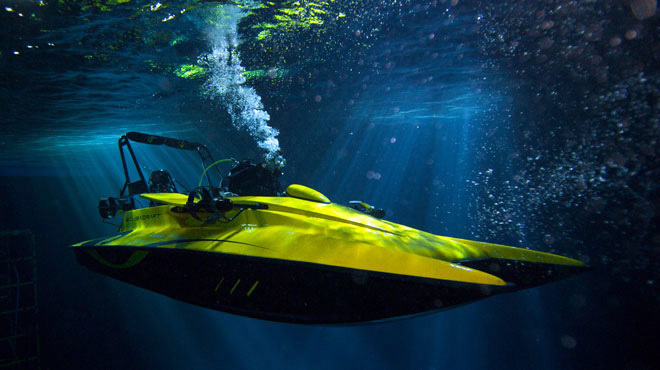 The modular configuration allows for the electric system to be removed and replaced as necessary, adding extra batteries for extended operations or more thrusters for more power. 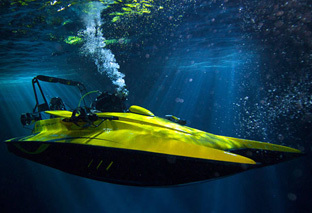 The occupants breathe via standard scuba gear - allowing them to leave the vehicle at will. 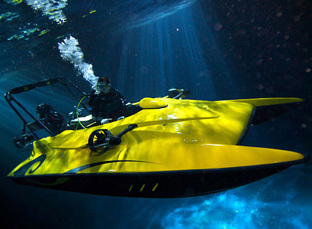 To resurface the tubes are inflated which brings the vehicle to the surface. Once above water any remaining water is drained out through the bottom. 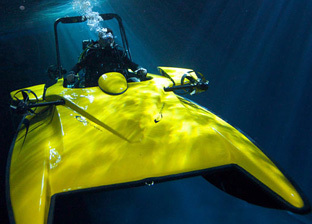 As expected from a vehicle as versatile as the Scubacraft SC3 the designers envisage a wide variety of possible applications including: Private leisure for the wheel-heeled scuba diver, commercial leisure trips for tourist divers, marine conservation, undersea inspection of structures and vessels, undersea filming, coastal enforcement, and search and rescue operations. 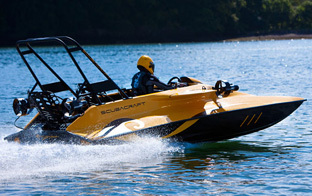 Currently Creative Wordwide Ltd are working on a six-person version of the Scubacraft called the SC6.